King, a 3-year-old microchipped and stolen husky from Atlanta in 2017, makes his way to and home in Sidney after and being lost several times and multiple change of owners. SIDNEY — A husky, stolen from Atlanta in 2017, has found a home in Sidney. The husky had several different owners since he was stolen. He was also lost several times. Two sets of “owners” — one from Sidney, and one from Atlanta — claimed the microchipped dog after he recently was lost and then found. In the end everyone agreed the dog should stay in Sidney. 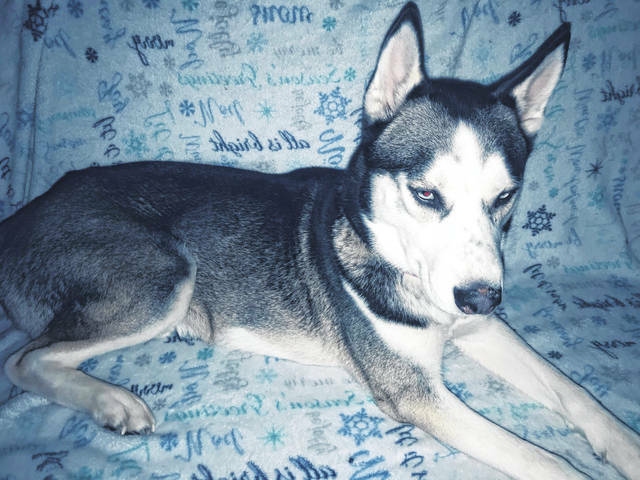 Shelby County Sheriff’s Deputy and Dog Warden Kelli Ward said the husky was picked up by a deputy on Kirkwood Road on Jan. 16. He was not wearing a dog tag so he was scanned. The dog’s microchip revealed his owners were from Atlanta. They were notified and Treah Caldwell began making arrangements to come to Ohio to collect her dog. King, a 3-year-old husky, was stolen from his owner’s yard in Atlanta two years ago. Caldwell said he previously got loose and then was microchipped to prove his identity if ever lost again. Caldwell and her neighbor, Deidra Ridges, who physically kept the dog at her residence, shared ownership of the husky that they named Polar. When Polar was stolen from Ridges’s yard, Caldwell said, they were heartbroken, but also somewhat relieved because he was microchipped. They thought he would eventually show up. However, mid-January was the first time in two years his microchip was scanned, Caldwell said. The microchip company, HomeAgain, notifies owners via email whenever their animal is scanned, she explained. Caldwell said they searched for Polar and posted he was missing on Facebook, but heard nothing until Ward contacted her. “We kind of gave up hope. But when I got the call, I thought great, Polar is in Alabama. Because there is a Shelby County here in Alabama. Then I looked at the Caller ID and saw the call was an Ohio number. I had to ask where they were calling from,” Caldwell said. Meanwhile, in Ohio, Sidney resident Autumn Thomas, contacted the animal shelter looking for her lost husky, which turned out to be the same dog. Thomas said the husky had multiple owners prior to her husband buying him from a co-worker last March. But mid-January, King got loose and became lost for 24 hours before she realized the Shelby County Animal Shelter had him. Ward said she told Thomas the husky’s microchip indicated his owners are from Atlanta and they were planning to travel to Ohio to get the dog. Thomas said she asked Ward if she could communicate with Caldwell. She wanted to let the Atlanta owners know how much he meant to her family and that he had been well cared for at their home. Caldwell admitted to the Sidney Daily News that Ridges did not sound as excited as she was about the dog being found. She said after Polar went missing, she thinks Ridges was very heartbroken and shut down her emotions in order to cope. Ridges would have been the one to keep the husky, she said, but now with a very busy work schedule the adjustment would probably have been difficult. Caldwell said she was in the process of raising funds to travel to Ohio, but given Ridges’s lack of excitement, and after talking with Thomas, they decided to let the husky remain with the Sidney family. Thomas said her family were unaware King was microchipped or that he had been stolen from his home in Atlanta. She said she was not just upset but also a little hurt because the person they bought King from told her family he was not microchipped. Thomas said she came to realize, however, the previous owners did not know King had been microchipped. Thomas said King stayed at the animal shelter for about a week after she was notified, and needed to get him registered in her name, pay a fee to transfer the microchip to her name and pay a small boarding fee before taking him home. She said he was very happy to see her and is doing well.